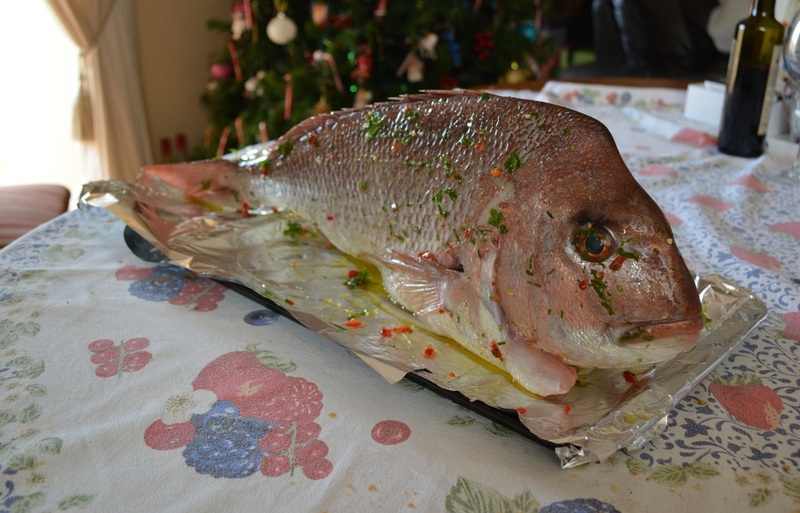 I was watching Italian Food Safari one day and I saw a snapper being baked standing upright, immediately I thought how impressive that looked, I had never thought to bake a fish propped up on its belly. The only thing I didn't like was he scored the fish so much that it looked really messy when he served it up, so I chose to not score it all. 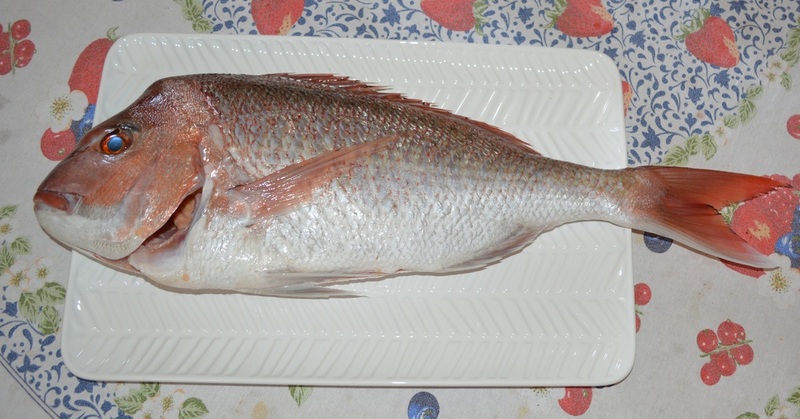 Then my husband went fishing one day and came home with this 2.5-3kg snapper, and I immediately thought of that recipe I saw on Italian Food Safari. So out I pulled my Italian Food Safari Cookbook and I found the recipe, it was so easy to make. And now that I had a fish, the other ingredients I always will have in my house. The original recipe is to bake the fish in the oven, but we did ours outside on our gas barbecue, which my husband has mastered. 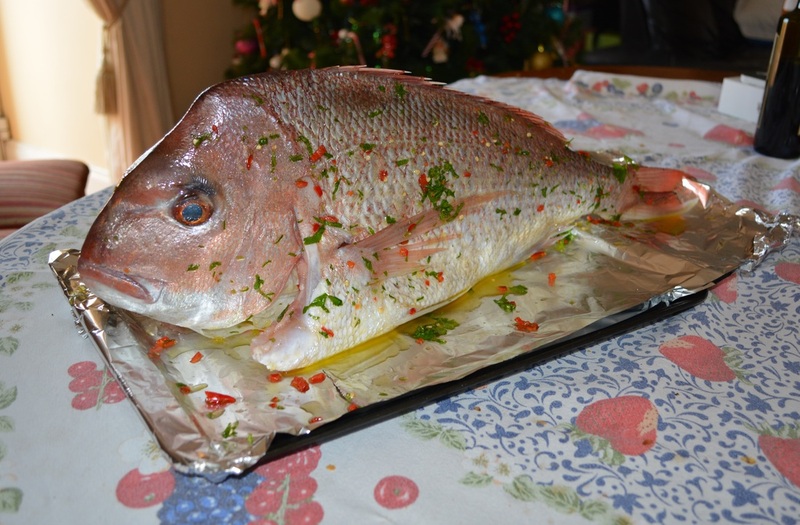 If you have a fishing enthusiast husband like I do, or you just love fish and go to the fish market to buy one, this is so worth a try, it looks impressive and it tasted great. Preheat your oven or barbecue to 180C. Season the fish well with salt and pepper, do not forget to season inside the cavity. Mix together the olive oil, parsley, chilli flakes and oregano in a small bowl. Get a large baking tray and line it with aluminium foil that is at least 30 centimetres longer than the fish, (if the fish is longer than the tray as mine was). Fold the excess aluminium over so that it is the length of the fish when folded, the excess aluminium foil serves as an extension of the baking tray. Line the aluminium foil with baking paper as long as the fish. This is important as the fish will stick to aluminium foil, I learnt my lesson. Brush some of the chilli oil inside the cavity of the fish. Get some more baking paper, scrunch it up and insert it into the cavity of the fish, keep adding scrunched up baking paper until you can get the fish to stand upright. Place the fish upright on its belly on your prepared baking tray. Now brush the snapper all over with three-quarters of the remaining chilli oil. 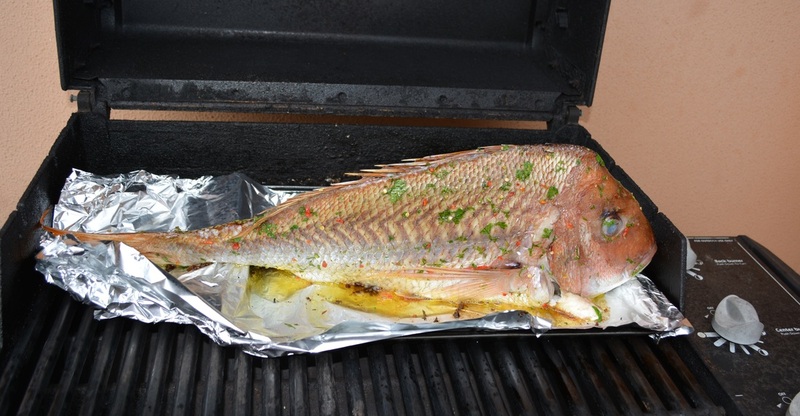 Bake the snapper for 30-40 minutes. If using the barbecue, keep the barbecue cover down and make sure the temperature is consistently 180C. While the fish is baking make the parsley and garlic oil. Place the chopped parsley and finely chopped garlic in a small bowl, top with extra virgin olive oil, season with salt and pepper, mix to combine. There needs to be enough oil to cover the parsley and garlic, add more oil if needed. In the last 10 minutes of cooking, brush the snapper with the remaining chilli oil. Remove from the oven or barbecue. Using a fish slice or two large tongs, carefully place the fish standing upright on a serving platter, if you think it will fall apart, just leave it on the tray. Serve immediately with the parsley and garlic oil.